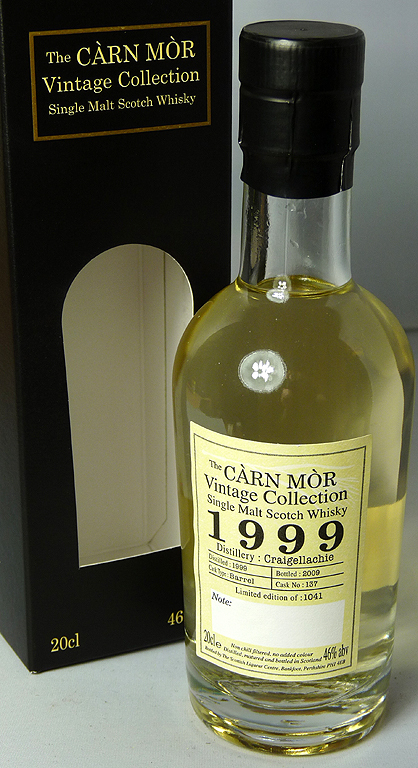 This Craigellachie is part of the 24 x 20cl bottles that make up the Carn Mor Vintage Collection. Distilled in 1999 and bottled in 2009, it’s from a limited edition of 1041, Cask No: 137. Non-chill filtered, no added colour and 46%. Nose: The nose is very spirity and grainy. Close to the new make, it would seem. Mostly white fruit like apples and pears, sweet malt and some white sugar. Not much else, though. Taste: It is oily on the palate and thanks to a mild mix of peppers shows a little more character. But still rather flimsy. Very sweet and again rather spirity. Finish: The finish is short and sweet. Comments: This is a little Craigellachie. Nice to have tasted, but nothing to be on the lookout for. This entry was posted in Craigellachie and tagged 1999, 20cl, 46%, Carn Mor, Craigellachie, NAS, Single Malt, Single Malts Direct, Speyside. Bookmark the permalink.